At first glance, most people might think a savoury pastry dish and a circular black slab of synthetic resin with a hole in the middle make for unusual bedfellows. But for Steve Courtnell, the owner of Pie & Vinyl record café, the coupling is a perfectly natural one. Steve’s shop is located on Castle Road in a semi-leafy area of the Southsea district of Portsmouth, just a pebble’s throw away from the beach. At the top of the road, Sir Arthur Conan Doyle wrote his first two Sherlock Holmes stories, while at the bottom is a blue plaque commemorating the birthplace of Peter Sellers. Now it’s Courtnell’s shop, opened in 2012, that’s adding to the cultural heritage of the location. As soon as you cross the threshold and enter Pie & Vinyl, you know you’re in for a sensory feast. Accompanying the sonics emanating from the turntable behind the counter, the inviting smell of freshly heated pies wafts around the room. And if that wasn’t enough, the shop’s wonderfully weird, quasi-Victorian décor is a sight to behold. To put it mildly, not everybody shared his vinyl-shaped vision of the future. “Of course, when you float this idea around to your friends and family, they think you’re going mad. At the time, record shops were dead – physical-format music was dead.” And that’s where the pies come in. While working in London, Steve had encountered Manze’s traditional pie and mash shop on Tower Bridge Road and was impressed by its popularity and simplicity of approach. Then, serendipitously as it turned out, a friend of a friend got a job at award-winning restaurant Pieminister in Bristol, and the humble pie was added to the record-shop mix. “I wanted to create a tangible experience for customers coming into the shop. Just like putting on a record,” enthuses Steve. “You pick up the record, look at the sleeve, take it out of the inner and place it on the turntable. There’s no real experience in simply pressing return on your keyboard to listen to music. I want Pie & Vinyl to provide everything the internet can’t. As long as we’re doing that, I believe we’re doing a good thing.” It seems Portsmouth’s record-buying public has bought fully into the concept. 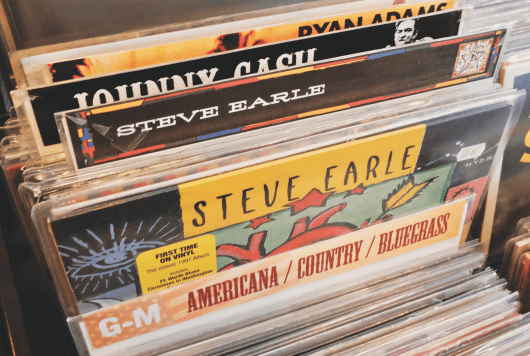 Another nod to a love of all types of music – and Pie & Vinyl’s approach to inclusivity – is the way the records are displayed. A conscious decision was made to have just a simple A-Z approach, with all the vinyl lumped lovingly in together and absolutely no specialist sub-sections for dub, krautrock, electronica, acid-folk, world or whatever. Riding neatly on the back of the vinyl revolution, the shop has been open now for five years and the Pie & Vinyl ‘brand’ is evolving nicely. 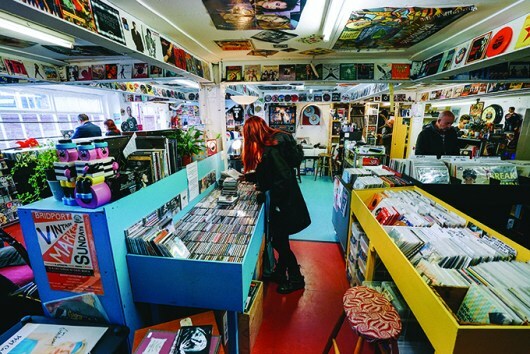 The operation boasts its own record label (check out Highlights Of Our Modern World), more than its fair share of coolly branded merchandise, numerous in-store performances, a record club and even a small satellite shop down the road selling turntables and separates – the imaginatively titled Pie & Hi-Fi. While nothing is taken for granted, it’s Steve’s ambition to open another shop, Pie & Vinyl 2, some time this year, in a location yet to be decided.